Welcome to another instalment of our Beginner’s guides! This is the article to read if you are thinking of taking up bass, or indeed buying a bass as a gift for a loved one. The market place for beginner-level basses is crowded and fierce with lots of bewildering choices to be made. To make things simple and as straightforward as possible, we have selected a few star buys and rounded them up here to guide you into safer waters! Whether you are shopping for a bass guitar only or an entire starter pack, you’ll find what you need here! Fledgling bassists of the world, we salute you! You have figured out some important life lessons: that there is a shortage of bassists in the world, that they are often the coolest members of the band, and that the bass is reasonably easy to get good on quickly! Good effort! Now, that does not mean for a second that bass is ‘easier’: it’s just easier to get ahead more quickly. Mastering any instrument is a life-long passion but, armed with the correct instrument from the get-go, your progress will be fun, satisfying and addictive. Check out these picks and have a blast learning bass! Let’s go! SX kick things off for us with a cool bass, available in three colours (currently at least, stock moves very fast this time of year!) and made to a sturdy, reliable level of quality. The SX PB Bass is made in what we call a ‘P-Bass’ style, after a famous 50s design that is still one of the most widely used bass models ever. So, this has a full 34” scale length (shorter basses are available, as we will see later) and has one split-coil pickup for a powerful and classic sound. You really can’t go wrong with this ultra-affordable take on a design that has lasted over 60 years! The three colours – Red, 3 Colour Sunburst and Black – all look brilliant and it’s available (in Sunburst only) for lefties too! This next bass is quite significantly different to what we’ve seen and represents a legitimate alternative choice for a wide range of would-be bassists. Epiphone, for the uninitiated, are the official import brand of licensed Gibson guitar designs. 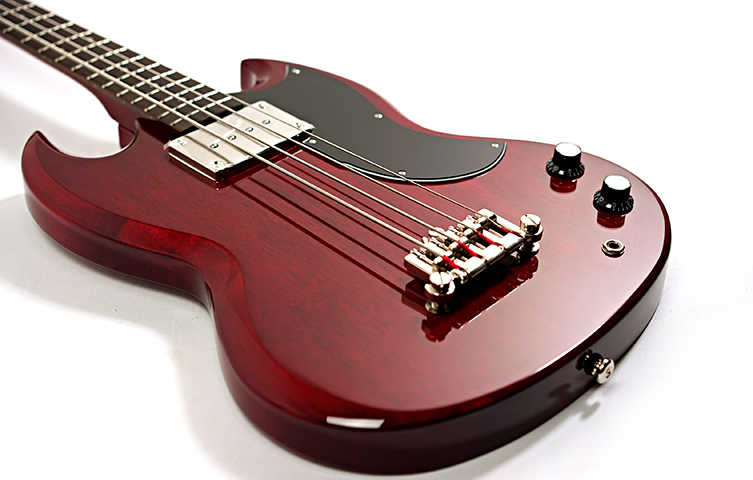 This model is based on the SG bass, a classic from the days of the British Invasion. It’s a short-scale bass, which means the length of the neck is shorter overall than what we’d refer to as ‘standard’ or ‘long scale’. This makes the EB0 easier to play, not just for smaller/younger hands but also for guitarists transitioning to bass and finding the extra size a handful. The style is great, with that iconic SG horned body finished in the perfect shade of Cherry Red. For a smaller but no less powerful sounding bass, this choice has character and quality in spades. 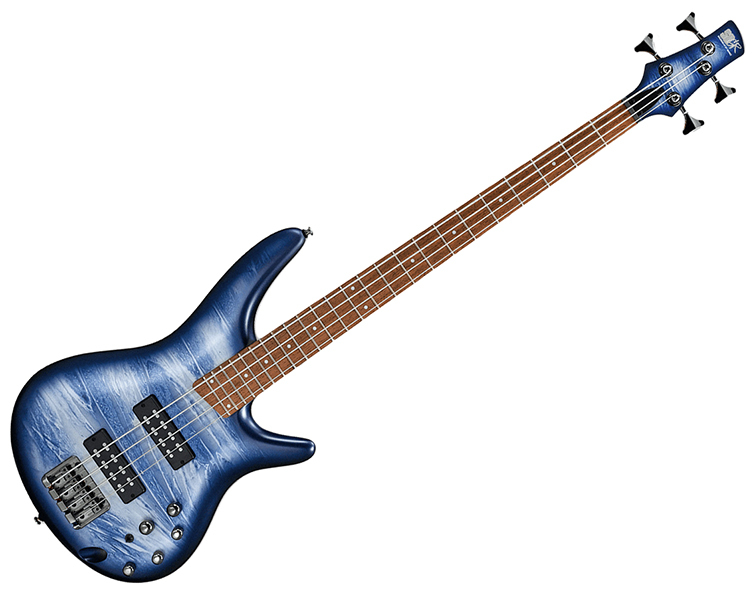 This next bass is priced at a point that will be attractive to beginners but make no mistake: the Ibanez SR300E is a bass with more than enough quality to confidently take you into rehearsals, recording sessions and live stages! Ibanez are known for their robust dependability, from the humblest instrument to their most high-end. Ibanez guitars and basses are always a good choice, frankly. So, this model is versatile and powerful. The neck is slim and very easy to get on with and has excellent access to the upper frets. Two powerful humbucking pickups provide a strong, punchy sound that’s perfect for Rock, R’n’B and a myriad of other styles. There are also some powerful electronics onboard, allowing you to have fun sculpting a range of diverse tones from the EQ control knobs. Best of all, the finish is a very striking, limited edition Navy Planet Metallic! It’s beautiful, attention-grabbing and very well put together! There is plenty to love here! If you’d like to purchase everything in one go, why not check out a bass pack? Inside one box, you’ll find a bass, an amp and a host of accessories. These make for impressive gifts indeed, plus the take out a lot stress and second-guessing when thinking about what to buy. Fender are the company that began it all with their Precision Bass back in 1951. Their other main model is the Jazz bass and elements of both are present here in this wonderful PJ bass! 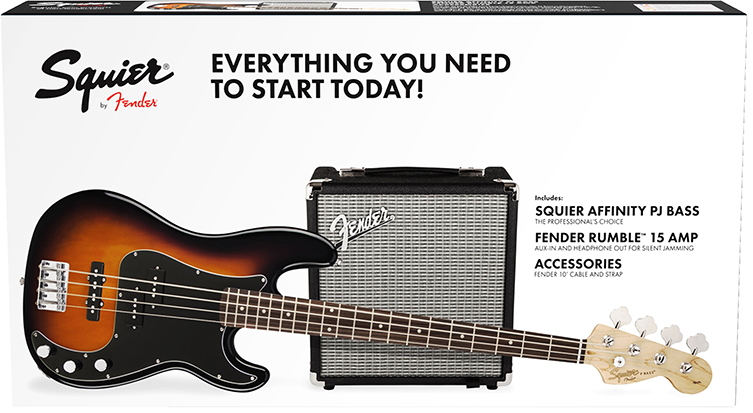 Squier are Fender’s official Far Eastern import brand. Since the 80s, Squier have been equipping generation after generation of musicians with affordable tools to get going on their path. Almost every guitarist and bassist has played, if not owned, a Squier instrument. 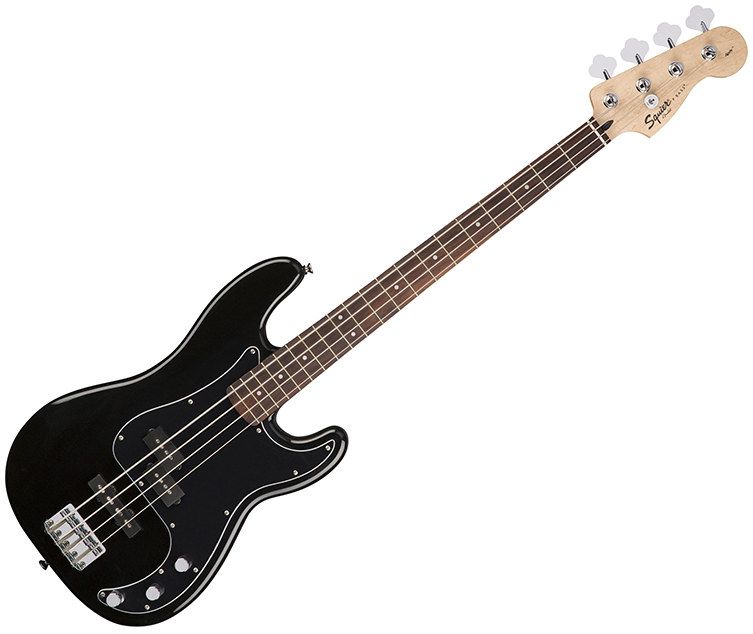 The PJ Bass has the body of a Precision Bass and the pickups of both Precision and Jazz models. P+J, geddit? It’s a great idea since the variety of sounds increases considerably with both types of pickup available to use. The bass itself is a joy to play and has that touch of authenticity that can be found nowhere else outside of a genuine Fender. This great pack features a 15 watt Fender Rumble amp which is plenty for the house! You also get a strap, cable and plectrums: everything you need to plug in and play right out of the box! We have packs available with both Black and Sunburst PJ basses. Each of these choices represents a different vibe and price point. As you can see, the market is wide and contains lots of basses to admire and choose from. We think you’ll be well served by all of the Top Picks here but if you have further questions, don’t hesitate to get in touch! We are always here for you and are happy to help. We want your first foray into bass buying to be memorable for all the right reasons. Happy shopping and Merry Christmas!